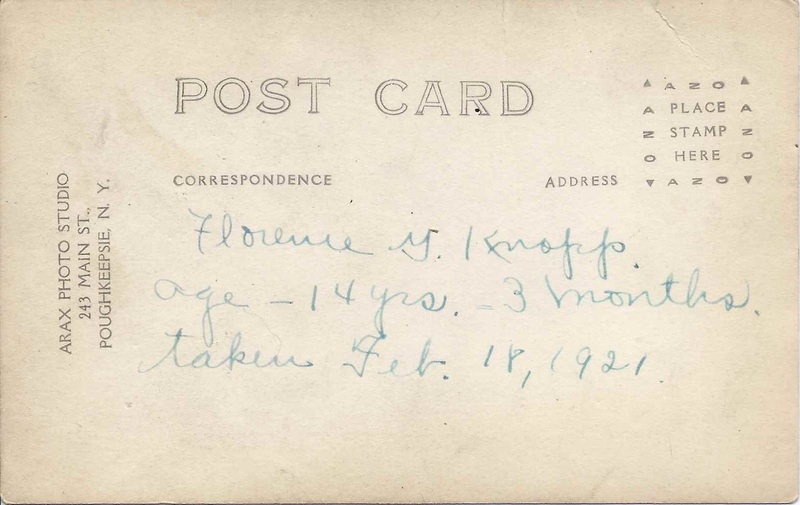 Real photo postcard of a girl identified on reverse as "Florence G. Knapp, age - 14 yrs. - 3 months; taken Feb. 18, 1921". The postcard was produced by the Arax Studio of 243 Main Street, Poughkeepsie, New York. Researching online, I found a few possibilities for a Florence G. Knapp, but perhaps a reader who recognizes the girl from family albums will come forward to identify her. Based on the hints in the photograph, Florence would had to have been born in the fall of 1906. 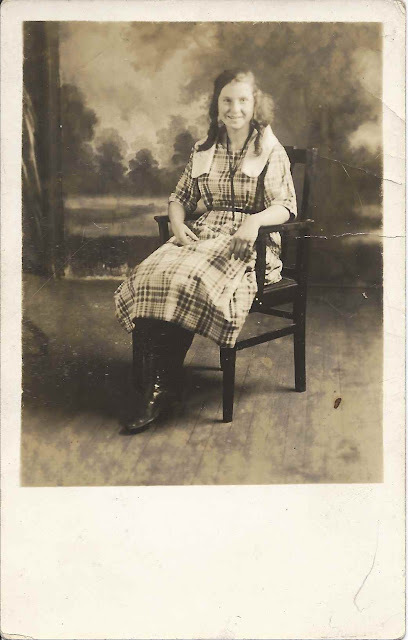 There was a Florence G. Knapp, born 2 November 1906, who married Harold A. Anderson, son of John [or Peter] and Ella Victorina (Carlson) Anderson, Scandinavian immigrants to Connecticut. Harold was born 30 May 1905. This Florence G. (Knapp) and husband Harold lived in the Bronx, New York; Boston, Massachusetts and at Concord, New Hampshire, where they both died. Harold was the manager of a department store. I don't have any information on this Florence's parents or where she was born. If you can identify the girl in the photograph, please leave a comment or contact me directly. I don't know this girl. However, I was scanning old family photos recently and came across post card photos, also. Guess it was popular.